Kara Zor-El finds herself on I'Noxia, a world that can reconstruct and re-create dead planets from memories and data. She is currently face to face with someone who looks a lot like a cyborg version of her cousin Kal-El. He claims to have no memory of his past and needs Supergirl's help to be, as he puts it, "complete" because he is not part of I'Noxia's trans mutative properties. Meanwhile, something in this being also reminds Kara of her Uncle Jor-El. The Maid of Might is certainly going to have a lot to consider if she is going to assist this Cyborg Superman. Delacore and Cyborg Superman access Kara's memories of her home on Krypton. An area of I'Noxia transforms into her house, and that's not all. Kara has tears in her eyes as she is greeted by her mother Alura In-Ze. In spite of it not being real, Supergirl accepts this gift. However, as a voice speaks to the half robotic version of the Man of Steel, the emotional reunion is perhaps exactly what the Cyborg Superman wants to get what he needs from the Lost Daughter of Krypton. Will his motives be benevolent or sinister, and will Kara Zor-El survive a confrontation with him if it's the latter? 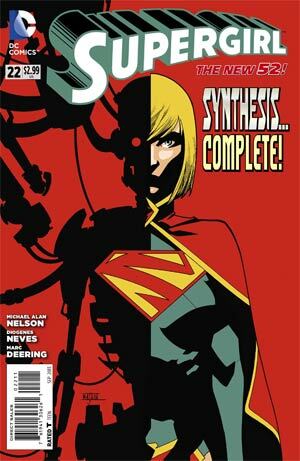 In addition to being with friends and family, Kara believes that the Cyborg Superman can cure her of the Kryptonite poisoning until she learns of the catch. She bust be assimilated into the I'Noxian consciousness, and her flesh will help reconstruct the Cyborg Superman. Supergirl refuses, which leads to a confrontation with RoboKal. He wants her to understand what he's gone through. Yet as Kara points out, her body is hers and nobody else's. As the Kryptonian dog fight rages in the skies, I'Noxian versions of Supergirl, Superman, The Justice League and everyone the Girl of Tomorrow has encountered since her awaking from suspended animation are released. She manages to defeat some of them, but the I'Noxians may prove to be the most powerful foe Supergirl has ever faced. Story - 4: This was fast, entertaining and full of interesting plot threads. Granted, a lot hinges on what Michael Alan Nelson's intended direction with this story arc is, and admittedly, I do have one problem with this issue, which I'll get to shortly. Yet, this second chapter is a vast improvement to the previous one. Okay, I have no problem with a reunion between Kara and Alura. I do, however, feel one point should not have been overlooked. That's the fact that Alura killed Zor-El. Okay, that was done to protect Kara, but that elephant in the room should not have been avoided in the scenes with Supergirl and her mother. It was sloppy of Nelson to leave that out in my opinion. The I'Noxians are almost on par with Star Trek's Borg and Doctor Who's Cybermen at this point in Nelson's tale. They are among the many things that have improved since the previous chapter was released. This issue was a lot more fun to read, and I sincerely hope the rest is just as good as this run in the series progresses. Art - 5: I'm warming up to Diogenes Neves' style more than I did in the previous issue. It seemed to similar to Gary Frank, whom I enjoy, but Frank is Frank. His work doesn't need clones. Neves seems to have found his own way to render Supergirl's world. I still miss Mahmud Asrar's interiors. Yet, Neves is off to a good start with the series. Cover Art - 5: Could this be a spoiler of things to come for future issues? Whether it is or not, this cover shows off many of Mahmud Asrar's strengths as an artist. He combines the sci-fi with the horror and superhero genres in a way unlike a lot of his peers today.